Fall is for lovers. Everything about the season seems rooted in romance: leaves in shades of gold and crimson, swift breezes that nudge couples closer together and prompt us to cozy up by a fire. I catch myself rolling my eyes at the season’s showy displays while begrudgingly admitting that it is all rather pretty. I resent fall, not just because I’m experiencing it alone in a new city, but also because fall signifies the end. Spring’s optimism is long gone, summer’s frenetic energy is dissipating and I feel forced to slow down. Fall’s cool weather makes me want to park myself on the couch under a blanket and do precisely nothing. However, if there is one thing about this season that I willingly embrace, it’s the warm autumnal flavors of pumpkin and spice. As my friend Alissa said, pumpkin is “like the Matthew McConaughey of fall produce.” Sprinkled with some ginger and allspice for a little extra heat? Irresistible. I should also admit that these pumpkin spice are good. Really good. They are powdered sugar-dusted nuggets of goodness with tender, golden insides. I adapted them from a very basic recipe for polvorones, which I have always known as Mexican wedding cookies, a simple, not-too-sweet shortbread-like cookie made with nuts and no leavener. Polvorones usually call for a good amount of butter, but I cut the butter in half in order to incorporate pumpkin purée. I also swapped in coconut oil for the remaining butter (since I like the taste and coconut goes well with pumpkin) and ended up with vegan cookies. The cookies are a little less crumbly than their all-butter counterparts, but I loved them nonetheless. Don’t have coconut oil? Go for butter instead. Either way, definitely make these cookies. Tender and nutty whole wheat pumpkin pecan cookies that are so simple to make. These little fall treats are vegan if you use coconut oil instead of butter, but if you are a butter lover or if that is all you have on hand, by all means go with the butter. Little hands might like to help roll the dough into balls, and since there are no eggs, you can savor a spoonful of dough without worries. I daresay these cookies might be better on day two. Preheat oven to 350 degrees Fahrenheit. Line a cookie sheet with parchment paper. Lightly toast the pecans in a skillet over medium-low heat, stirring frequently, under they are nice and fragrant. Remove from heat. You can either use a food processor to finely chop the pecans (about 10 pulses should do it, don’t blend so well that you end up with pecan butter) or finely chop the pecans with a chef’s knife on a cutting board (you might want to let the pecans cool a little before chopping). 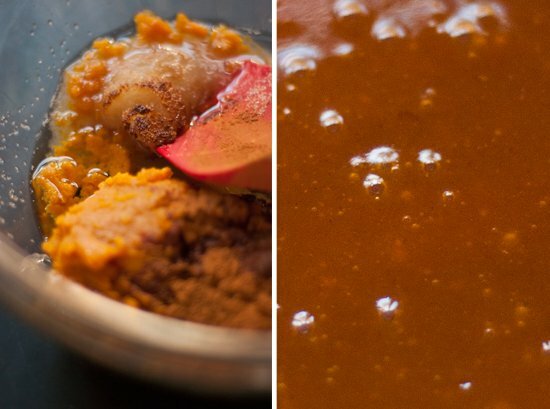 In a large bowl, beat the coconut oil or butter, pumpkin purée, cane sugar, vanilla, cinnamon, ginger, allspice and salt with an electric mixer on medium speed until light and fluffy. Since I used melted coconut oil, it didn’t get light and fluffy but it did blend well (I wonder if it would get light and fluffy with solidified coconut oil at room temperature?). Gradually add the chopped pecans and flour, beating on low speed after each addition until well blended. 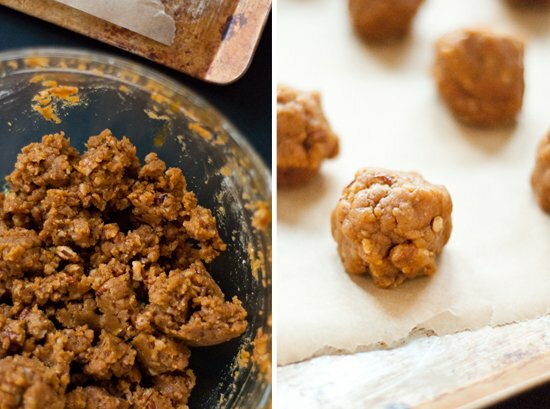 Using your hands, shape the dough into 1-inch balls. Place the cookies on the baking sheet, leaving about 1 ½-inch space around each cookie (the cookies will not expand in size). Bake for 14 to 15 minutes, until the bottoms of cookies are lightly browned. Let the cookies cool for 5 minutes on the baking sheet. Pour the powdered sugar into a small bowl and roll the warm cookies liberally to coat in powdered sugar. 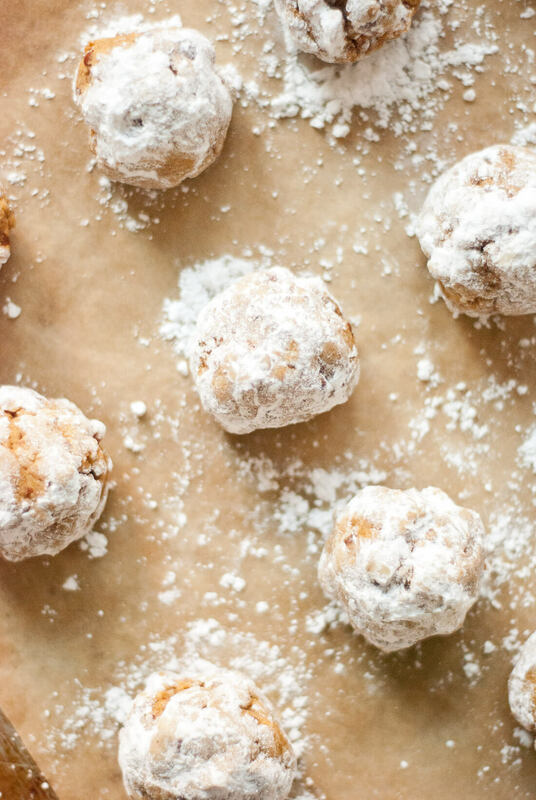 Taste, and if the cookies aren’t quite sweet enough to delight, give them another roll in powdered sugar. Let the cookies cool on a wire rack. Recipe adapted from Kraft’s recipe for Mexican wedding cookies. Yields 18 to 20 cookies. Recommended baking tunes: Grizzly Bear’s Shields (listen on Spotify). Make it vegan: Be sure to use the coconut oil instead of regular butter. These look H.O.T…..just like Matthew McConaughey! Mmmmmm. I want to snuggle up with both of them under a blanket. Shhhh, don’t tell Kiley. What a great idea! 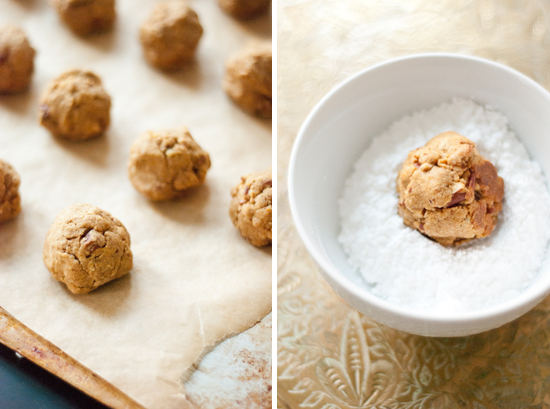 I love those crumbly little cookies & adding pumpkin is a wonderful addition for Fall. I may have to make some to set out at my husband’s office – he’s a chiropractor so we’re always looking for semi-healthy goodies to share with his patients. I may even experiement with making them gluten free… Thanks for sharing! If you do try making them gluten free, please let us know how they turn out! I think oat flour might be good here. Please do make them, Michelle! No doubt you’ll love them. These are lovely! What a great fall cookie! These look incredible! And the color is amazing. I really, really want to make these. I’ve never even had Mexican wedding cookies, which is just silly considering I’m from Texas. These look so gorgeous, love your healthy additions (and well, subtractions)..
so intrigued by this recipe–definitely a must try! What a lovely autumnal twist on a familiar recipe! I hope baking and delicious things-made-with-pumpkin keep you warm and cheered as you deal with the impending cold and other trials. I’ve always loved fall, but know what you mean about resenting it. Winter is soooo long here in Minneapolis. Ugh. These sound so tasty! I love pumpkin-y things, and haven’t got around to making any yet. I’ll have to try these! Here I am dreading a cold Kansas City winter and you live in Minneapolis! I don’t know how you do it, Sarah. Hope you’ll make these when you need an excuse to turn on the oven. 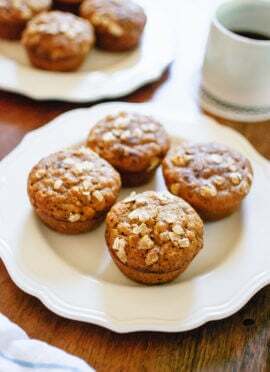 I never use wheat, I made them with spelt flour and no white sugar allowed in this house, so I used honey in its place, and no powdered sugar since it has corn starch and we all know how bad that is for you…..they are delish! I realize this ^ is an old comment… Great idea using spelt instead of ww pastry flour, I even considered a premixed, gluten-free flour. I used organic cane sugar in the batter but maybe I’ll try maple syrup since you’ve tried honey…just wondering how that will affect the moisture of the batter. I also made my own confectioners sugar to dress them by grinding (in blender) in that same sugar until pulverized. They turned out moist and such a treat. Will be making again very soon! Now I am made at myself for not having one of these Monday night! They sound so perfect! Ah, but doing nothing under a cozy blanket is like… an autumnal rite of passage! The Danes have it right (as usual): once the cool breezes blow in, they take up Hygge, which is more or less a pursuit of coziness. Like NEXT LEVEL coziness. Cooking, reading and quiet time are the main concerns of the day. It’s like pursuing sedentary activities as art form. Am I making fall sound maybe a tiny bit more appealing? Anyway. These cookies, so bomb. Can’t believe I hadn’t thought of mixing pumpkin into the polvorones party. Brilliant. I am so taken by the Danes’ concept of Hygge. I have central heat in this new apartment of mine, so I’ll be turning that on low and donning some slipper socks before long. Seriously, make these cookies. I swear they’re better on the second day. So beautiful, Kate! Your writing and photography is like a gift to my eyes each time you post. Hope you do make them for the party, Christy. I can’t say they’re the most attractive cookies on the outside, but it’s the inside that counts, right? I am not a fall lover either but I do love pumpkin – gorgeous cookies! All you had to do was liken these to Matthew McConaughey and I’m in. I love these kinds of cookies! 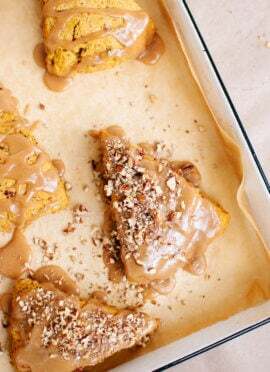 I love that you made them healthier and it was a great idea to add pumpkin. Can’t wait to try them! I’m from Argentina (sorry about my english) and as you love to travel, i think that you should visit our country someday.. i’m sure you’ll really like it!. i hope that your life in the new city get better i’m sure it will be! . Maia, thank you for your wonderful comment. I would love to visit Argentina someday. I’ll get there, somehow! I’m happy to hear that you and your sister have enjoyed my recipes. I will definitely be baking more now that the weather has cooled down, so I’ll have more baked goods for you soon! My guy loves polvorones. I love pumpkin spice. These cookies were made for us ;) Lookin’ good, lady! I know what you mean about the beginning of the end…I just try to remind my self that, on the bright side, ill be eating sweet potatoes almost exclusively for the next six months! Oh and pumpkin of course. Loving these cookies! Totally Matthew-esque. Yes to months of sweet potatoes! I ate one for lunch today, as a matter of fact. Can I use regular whole wheat flour? Good question, Amir. I think whole wheat flour will work and taste fine, but I don’t think the cookies will be quite as tender. So, I’m in love with these. I love Mexican wedding cookies, and I love pumpkin. They’re perfect. I am totally making these before Halloween. These sound so beautfiul! I’m a huge fan of Mexican wedding cookies, so I’m definitely going to try these. Great idea. I do think Fall is quite a romantic time of year, and I can imagine it being hard being in a new city! But, there’s something romantic about getting to know a new place by yourself, too. I love wedding cookies like this and your addition of pumpkin sounds fantastic! I also very much approve of the baking music choice! We’ve been listening to the new Grizzly Bear album like WOAH. Have a wonderful weekend, friend! Oh really? And I thought we had several things in common, but apparently one thing we don’t share is my love for fall. Ah well, we’ll find other things in common. Love the crumbly texture of the cookies, I’m still in need to baking with coconut oil. Which brand do you use? You are going to love coconut oil! I like Spectrum oils in general so I tend to pick the Spectrum coconut oil. Go for one in a glass jar. Gosh, I just came across your blog today and fell in love. Those cookies are spectacular! Hi Kate! I love pumpkin…everything, and these look amazing but I’m allergic to nuts. Any suggestions for ways to replace them in the recipe? Or do you think they would still be good if I just left them out? Thanks! Alex, I think the cookies would be good without the nuts but the texture would be lacking some of that delicate crunch. You could get creative with other add-ins. Dried cranberries/raisins/chocolate chips might be fun! 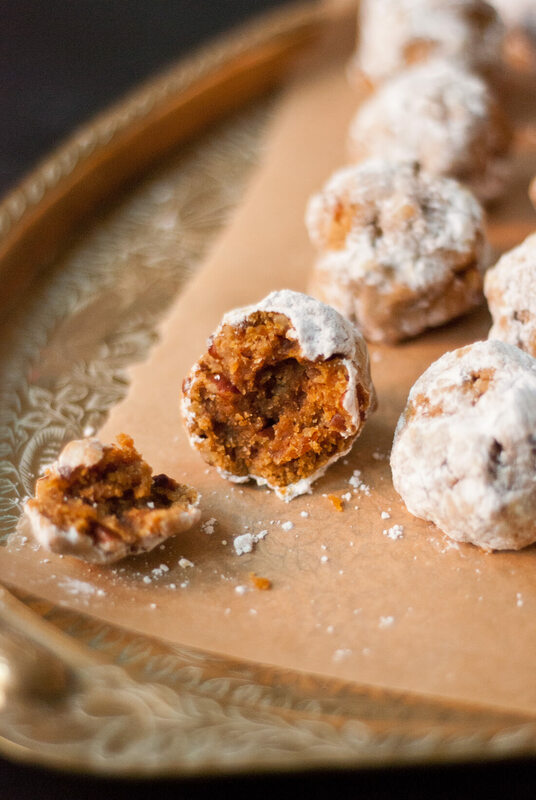 These sound so very tasty; love the combination of pecan & pumpkin. I made these to bring to a family dinner at a friend’s house and they got RAVE reviews. Everyone was impressed they were vegan too. After tasting the dough at the end I decided to add another probably 1/2 tsp of salt and more cinnamon, which made them taste right to me. I also didn’t roll them in sugar until they were completely cool, which makes them stay pure white and dry because the sugar doesn’t melt at all. So glad to hear it, Julia! Thank you for the feedback, it’s really helpful. I upped the salt and spices in the recipe based on it. I was trying to be conservative, but I really don’t think you can have too much spice in pumpkin-flavored treats. These cookies are so awesome. I mixed in the coconut oil at room temperature and the batter did get fluffy-ish. Yum! Great to know! Thank you, Carolyn. These look so fun and delicious! I’ve made Mexican wedding cookies before, but the addition of pumpkin looks great! Mhhh, they look absolutely delisious! Do you think I could use honey instead of cane sugar, or would the dough become too runny? Good question, Lena. I don’t think you could substitute honey for the cane sugar without reducing the liquid in the recipe somehow. The only liquid-y ingredients to reduce would be the oil or pumpkin, I’m really not sure if that would work! Please let me know if you try. these are amazing! perfect for a party & easy to transport! I could go for a little bit of do nothing time, a cozy blanket and a plate of these. I am just wondering how many cookies were you able to make with the ingredients listed. Thanks for the recipe! I can’t wait to try it! Yields 18 to 20 cookies.- I found my answer!! Just had to let you know I made these this evening and they are soooo good! I mean really, really delicious! I knew I’d love them but even my husband, who is not a pumpkin fan, thought they were outstanding. I see an addiction coming on ;) Thanks for this recipe!! That’s terrific, Sherry! I’m so glad you enjoyed the cookies. I have been going through withdrawals since I ran out of them… I think I ate four on the last day so I’m a little afraid to make them again! these were absolutely delicious! they were a huge hit at the fall party i brought them to, and i’ll be making them again this week for a work event. thanks for the inspiration! Victory! I’m glad you and your friends enjoyed the cookies, Katie-Anne. Thanks for commenting! Kate, I finally got around to making these for my husband (he’s a HUGE fan of your standard wedding cookies) and he LOVED them. 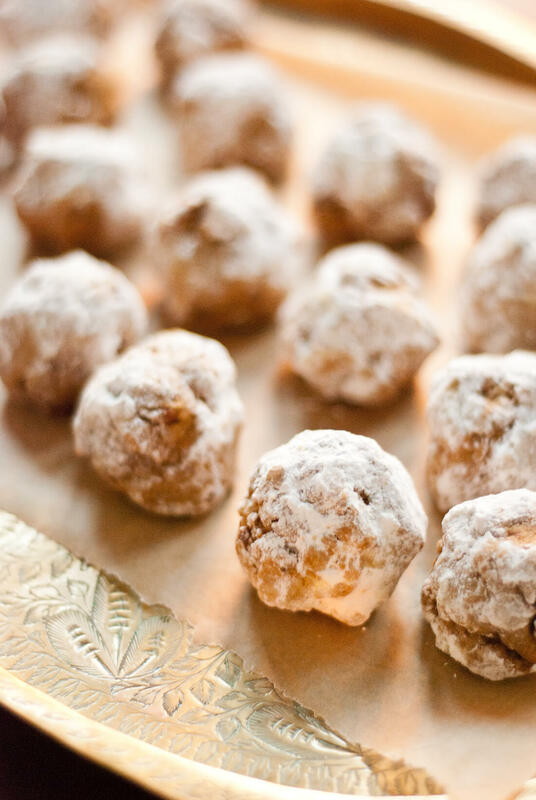 I rolled twice in powdered sugar like I do with my usual wedding cookies: once warm, which creates almost a glaze, and then once cool (and the semi-melted sugar helps the second coat stick!). 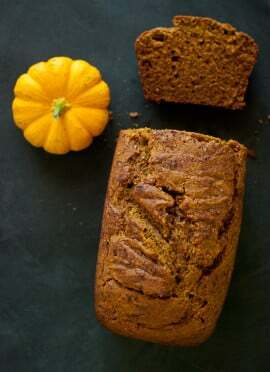 I will definitely be making these again…there’s still more fresh pumpkin in the fridge! Nice! Mine just came out of the oven and I am impressed. Thank you very much for sharing your substitutions! Your version sounds great. So I just made these and am still licking the powdered sugar off of lips and dusting my keyboard in a fne sheen of white powder. But I just had to tell you that these are AMAZING! So tasty and super easy. I will be making these again – thanks for the recipe! Hooray! Delighted to hear that you liked the cookies, Kate. Thanks Kate, another successful recipe I have made from your blog! These cookies were amazing, so easy to make and taste great!! I am going to make them again as a Thanksgiving snack for my family. I think my boyfriend had about 8 of them last night, I kept finding powdered sugar on the counter, on the rug, on the couch etc….they are almost all gone after one night! Haha, awesome! These cookies are addictive, can’t blame him for eating eight in one night. So glad you enjoyed them. Thank you for commenting, Ashley! So, I had to tell you… tomorrow night I am going to an autumn, “hooray, a friend got engaged” Mexican-food feast… and these cookies are PERFECT! They hit all three points of the theme for the party, and I can’t wait to share them! Thanks for the recipe. That’s great, Meghan! Hope you and your friends love the cookies. Since these cookies are AMAZING, I’ve decided to make a second batch for xmas. Why? I’m meeting my bf’s family for the first time and I bet these will win them over! a spelt flour. I can’t do whole wheat. Thanks. Yes, use the same amount of oil either way. I’ve heard that these are good when make with gluten-free flour blends. I have wondered if oat flour might be good, too, since these cookies don’t rise like most. I made these gluten free with a mixture of a gf blend they were fantastic! I’m glad they turned out well with gf flour. I thought they might be a good candidate for that since the cookies don’t really rise or fluff up. Thanks for letting me know, Karen! I made these and wrote about them here. I had such high hopes for these cookies. Ultimately, they are not the buttery shortbread delights that are the classic Russian Tea Cakes. I kept popping them into my mouth expecting the original version and being disappointed every time, just because they look exactly like Russian tea cakes! I do plan on making these again, but leaving them as raw cookie dough bites. I liked the dough better uncooked and that way they won’t look a thing like the traditional Russian tea cakes. I made these because I grew up eating these around the holidays…every…single…year and my father NEVER changed the recipe! So I was so excited to see a play on the original…AND THEY WERE AMAZING! I’m bringing them home to suprise my dad next week, thanks for the recipe! Thank you, Lindsey! I’m really happy that you enjoyed my spin on your family’s favorite cookies. Hope your dad loved them, too. These look incredible- great idea! Love the combination of Tex-Mex and Thanksgiving flavors in one little dessert. Will be trying them out when it turns winter here in Australia. These are great! If you coat them with powdered sugar hot, then do a second coat when cooled it sticks better and becomes opaque and pretty! Thanks, Traci! Thank you for sharing your tip, too! I was just wondering Kate, do you think I could make the dough ahead of time and freeze it? Then thaw, bake, and roll? I’m planning on making them for a party and wanted to do some of the work ahead of time. Can you let me know what you think? Hey Liesl, I haven’t tried doing that, but I think that would work well! These cookies don’t contain any leavener so I don’t think you have anything to worry about. I would freeze the dough in cookie balls so they’re easy to thaw and bake. Please let me know if you give this a try! Autumn makes me sad, the cold weather, not having anyone to cuddle with (even the dogs get sick of me). That’s why I named my daughter Autumn even though she was born in the Spring – it helped me get through those tough fall days when I was pregnant knowing that soon I’d have a little Princess. I think of fall the same as you, and ending to life, but actually, now I think of it as a dormant time, a time where everything is renewing itself to burst forth in spring! Bonnie, there is hope! Don’t give up. I like thinking of fall/winter as a dormant time. That’s a much more tolerable idea. Would these work with maple syrup, honey, or molasses instead of cane sugar? Possibly, but I’m not sure how the extra moisture would effect the final texture. Do you use coconut sugar? It’s a natural sweetener that might work great here. I’d still recommend rolling in powdered sugar if you’re going for a wedding cookie effect. HI, Kate! What do you think would be good substitutes for the cane sugar and powdered sugar? My daughter wants to make some decadent sugar-free fall cookies. Hi Kimberly, I’m sorry for the delayed response! That is a bit of a conundrum, because sugar makes cookies sweet and tender. Coconut sugar is a more natural, less refined sugar, and it may work instead of the cane sugar. I don’t have any substitutes for the powdered sugar, except maybe a drizzle of honey—but I’m not sure if either of these qualify for your version of sugar-free. These cookies are dangerously good! I made them using a vegan butter flavored stick and half brown and half bakers sugar. They are so easy and taste amazing. Thanks for this recipe! Thanks for sharing, Peggy! I’m glad you loved them.